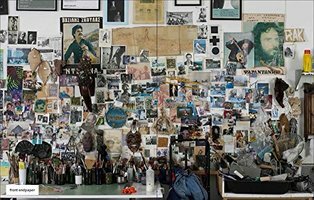 In 1969 the painter Jack Whitten arrived in the town of Agia Galini, on the Greek island of Crete. Shortly before leaving New York he’d had a dream in which he was commanded to find a tree and carve it. From the bus window he spied the tree from his dream. He approached the owner, but because Whitten couldn’t speak Greek, the man thought he was saying he wanted to cut it down. Whitten came up with a plan to communicate his aim: “I went into the surrounding hills, found some wood and set up shop on the harbor beneath some trees.” The owner understood immediately and even lent Whitten his tools. The totem he carved still stands in the town—a fisherman looks to the sea, an octopus winds around the trunk, and at the very top “is a large fish with its tail pointing to the sky.” This account, published in Notes from the Woodshed, a volume of the artist’s reflections on his art and practice, provides a key to understanding the gestural, communicative power of Whitten’s sculpture. Just as he was able to impart meaning by doing rather than speaking that first day on Crete, his sculptures—currently exhibited for the first time in a show that has arrived at the Met Breuer (New York)—express their strong emotional and spiritual content by foregrounding the physical acts of their creation. Carved, chiseled, polished, and hammered into insinuating, assertive shapes, these pieces make viewers feel the actual work, and sense the very grip of the artist’s hand on the hammer as it finds the chisel’s head.